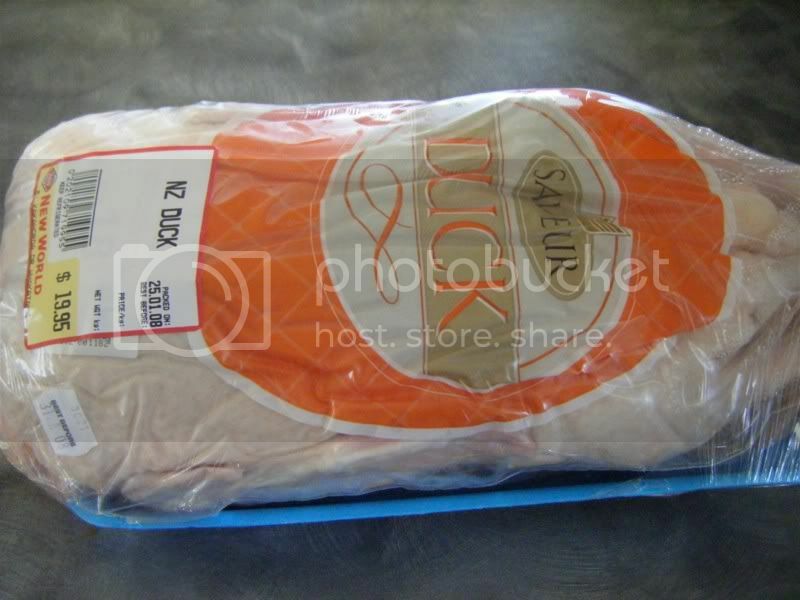 I have finally tracked down fresh duck and was absolutely thrilled to see it in the supermarket the other day! I have been desperate to try to cook duck in some form, I was looking for duck breast to make the gingery hot duck salad I had seen on Pistachio's blog a little while ago. But a whole fresh duck was the next best thing and while I optimistically thought I would be able to take the breasts of and make the salad and then do something else with the rest, I discovered that they are not the meatiest of birds so that probably wasn't going to be the best idea. 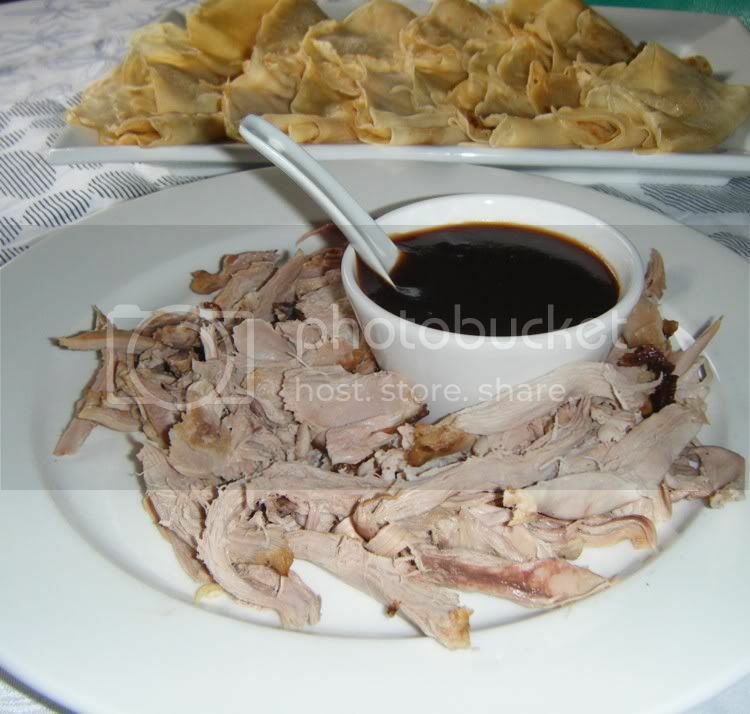 So I hit on the idea of doing Peking style duck, making the pancakes and sauce to go with it. It was a fairly involved process, so this post will no doubt be a bit of a photo essay! I searched the internet for a recipe that didn't sound too ominous and found one on the UKTV site. I was thrilled with the end result and although there wasn't terribly much meat, this fed 4 of us quite nicely. It was a lot of work but ultimately very satisfying and delicious! 1. Place the duck on a rack over a deep roasting tin. 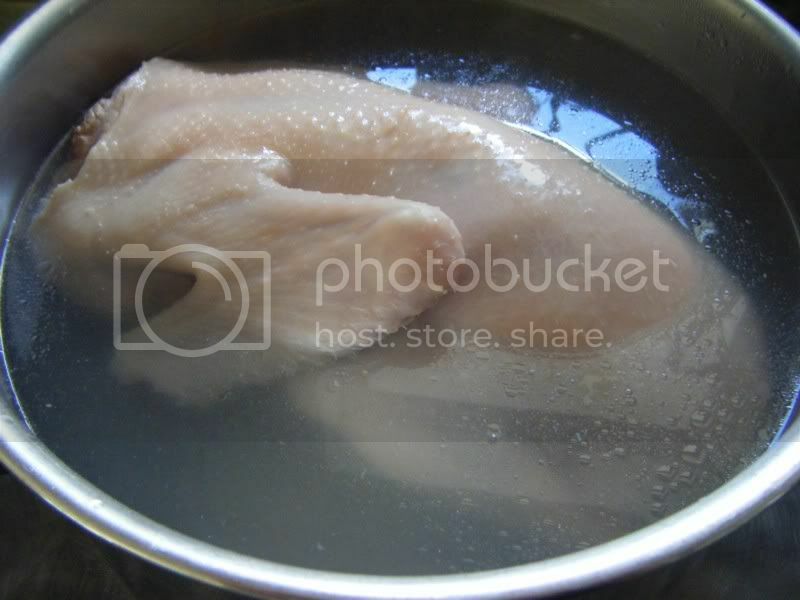 (I popped mine in a pot, poured water over and left for 10 mins) Pour over the hot water and leave on one side until the water has all drained away from the bird. 2. Discard the water and leave the duck exposed to air until it's really dry to the touch. 3. 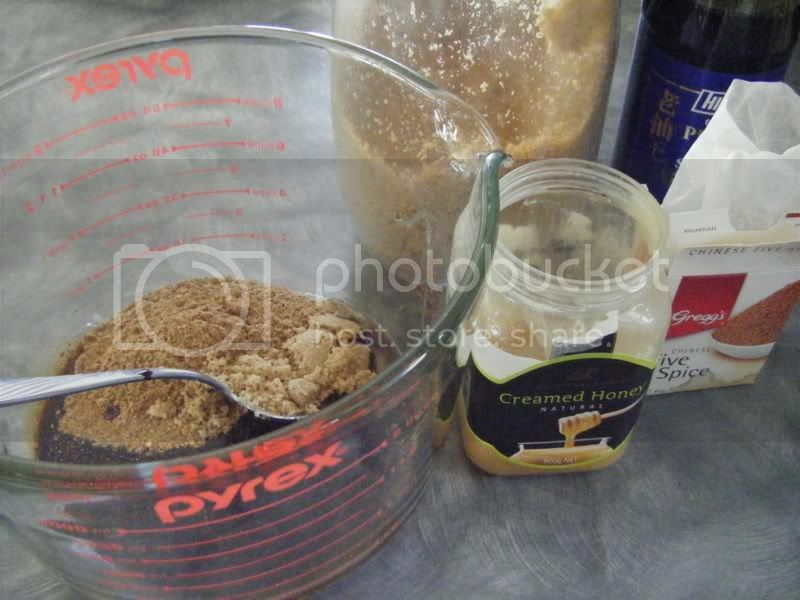 Mix the honey, soy sauce, five spice powder and brown sugar together. Using a pastry brush, brush this sauce over the duck, inside and out. 4. Leave the bird to dry once more. 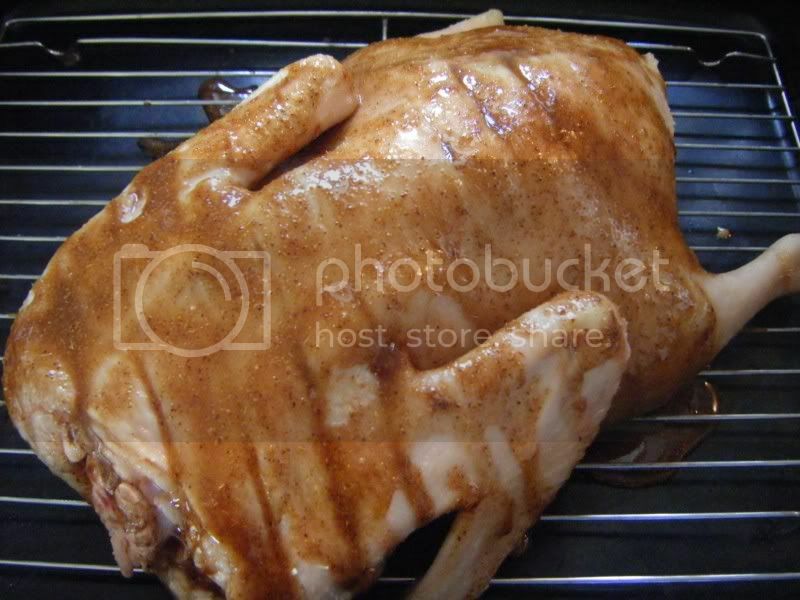 There should now be a thin glaze all over the bird. Give the duck another coat of sauce and leave to dry once more. Keep repeating the process until all sauce has been used up. 6. 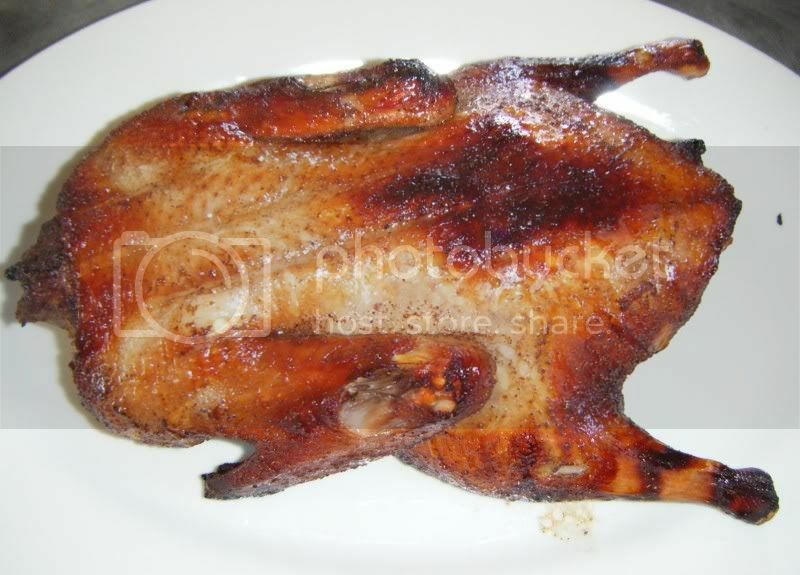 Roast the duck for 30 minutes before turning it over and cooking for another half hour, until the skin has crispened. Remove from the oven and leave to cool for about 15 minutes. Joint the duck and slice its meat off the bone. 7. While duck's roasting, make the sauce. Warm a wok over a moderate heat , and add the sesame oil, hoi sin sauce, caster sugar, water, soy sauce, and the cornflour and water mixture. Bring to a simmer, stirring, and cook down until the sauce has thickened. Leave to cool. 8. Warm the pancakes in a bamboo steamer for about 4 minutes. 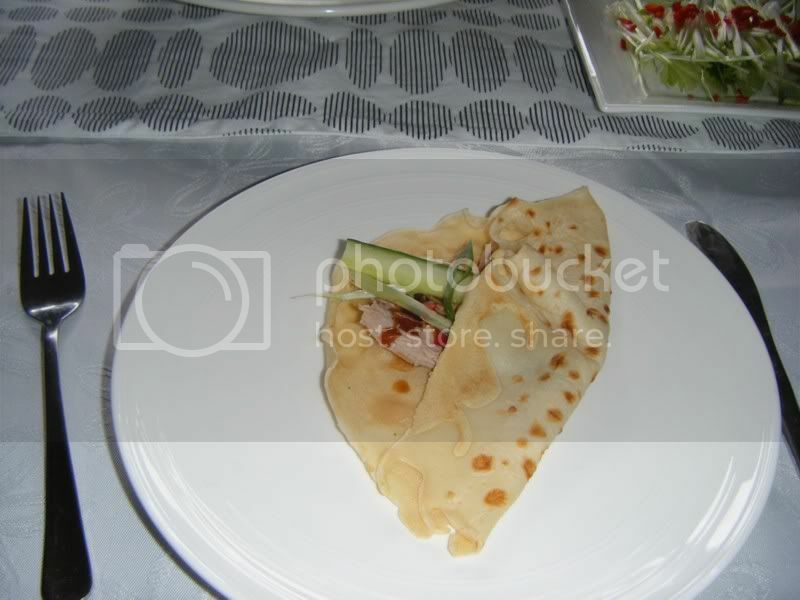 Spread a teaspoon or so of sauce over each pancake and scatter with a little of the spring onions and shredded cucumber. Top with a generous helping of sliced duck meat. 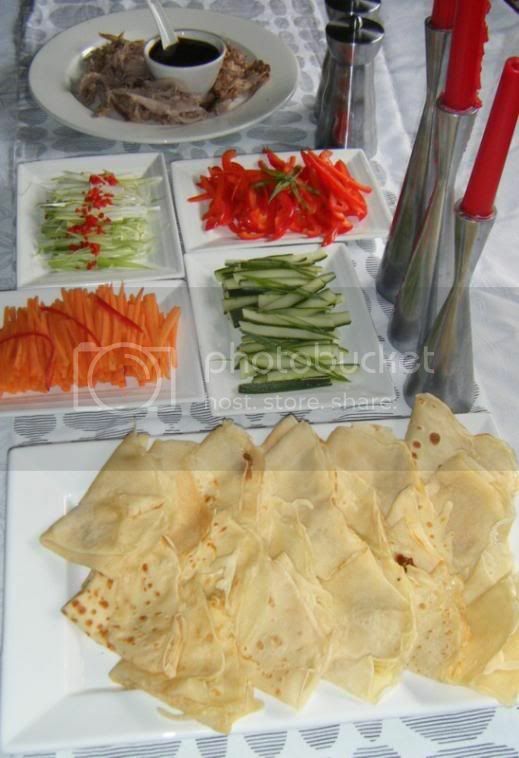 Roll up the pancakes into a cigar shape and serve. In a medium bowl, whisk together egg, cold water and salt. Mix in all-purpose flour 1/3 at a time. 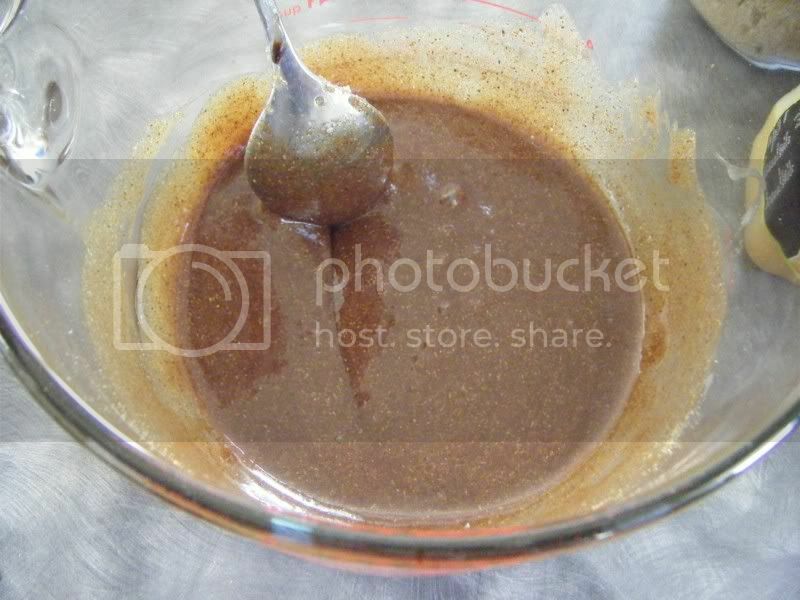 Allow the mixture to stand 15 minutes at room temperature. Heat a wok over high heat. Remove from heat and thinly coat with 1 tablespoon peanut oil. Reduce heat to low. While wok is still warm, pour 1/4 of the egg mixture in an approximately 8 inch circle. Rotate wok quickly to spread an even layer of batter. Cook over low heat 45 seconds to 1 minute, until bottom is golden brown and edges begin to curl. Carefully remove from heat and place on a paper towel, golden brown side down. Repeat the wok procedure with remaining batter, 1/4 at a time. Rub wok with remaining tablespoon of peanut oil after the second wrapper has been made. Allow the wrappers to cool completely. Cut wrappers in half to use for egg rolls. 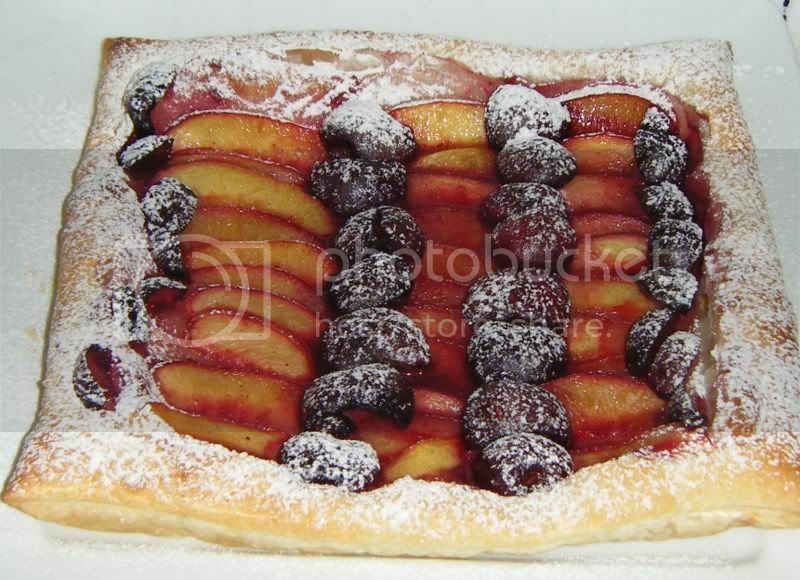 For dessert I rehashed the galette, this time with cherries instead of blueberries, again it was lovely! Wow Linda that looks fabulous. You've been so busy recently. And ... I'm so glad I can get on here now to post comments without my PC freezing on me. Yes Laura, I made a double lot so had to measure it twice, what a stupid measurement, and of course you know I just chucked it in dont you!!!!!! Wow! Looks like a whole restaurant menu and that duck just looks fantastic!